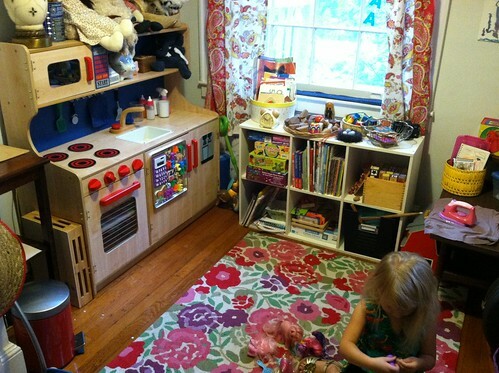 After reading Simplicity Parenting (a few thoughts on it here) I went through M's play room (she calls it her downstairs living room) and purged about half her toys. It still looked cluttered, but I reorganized the layout and found a place for everything. I've tried to teach her how to clean up her toys but those who know me know I have no business teaching anyone anything about cleaning. Simply getting everything in its place took so long we both ended up frustrated and irritable. Throughout the process M would find a toy she hadn't played with in a while and understandably want to play with it. The first few times I gently asked her to get back on task, then I finally resorted to the ol' standby threat, "Mabel, if you can't take care of your toys we're going to give them to someone who can." I had a box in my hand to really drive the point home. With that motivation she picked everything up, threw it all in the box threat and asked me who would get the toys and where we were going to take them. She didn't see it as a threat so much as an opportunity to share. Lesson learned. Since then we've been tidying a little bit every day but the room generally looks like the toy monster vomited a rainbow of plastic all over the floor. Yesterday I gave it a thorough once-over...it took a solid 8 hours. Since it's clean, I took a few quick camera phone pics. I'm not one to miss the rare opportunity to brag about a clean room. given a task she can do herself (e.g. hanging a jacket, putting away shoes) she rises to the challenge; it's a simple way to build her self-confidence and she loves knowing she can do something "by mine own self". Going through the room, I made a small pile of toys to get rid of. Then I whittled the selection of books, puzzles, and art supplies to about half. Those went into a closet to use as back stock. I bought a few more baskets to organize the cubbies. I like the clean look of those bins made fit these kinds of shelves and hide the clutter, but picked low-walled baskets so M can easily see what's inside. in loose themes like "things with wheels". At some point in the near future I'll add pictogram labels to each. I moved a table in from another room, making a corner for crafting. 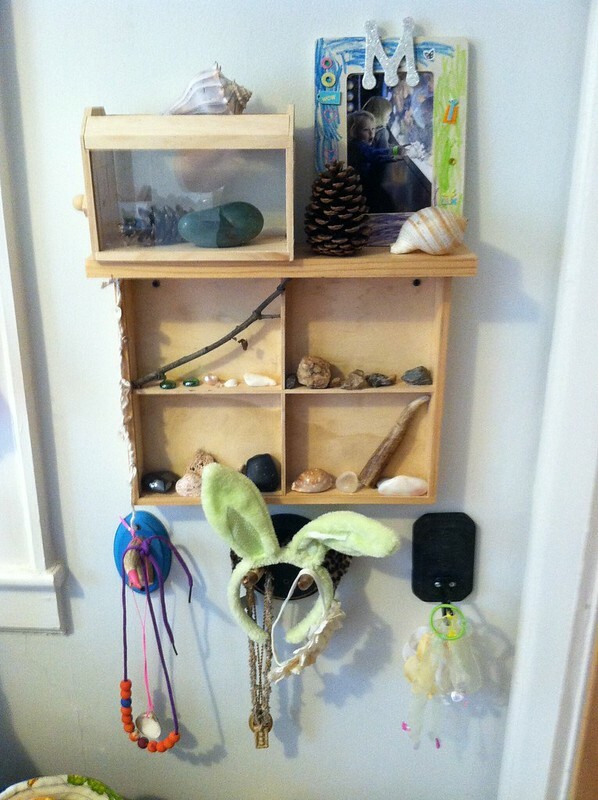 Above the table are some cute little clips for an easily changeable display of her artwork. 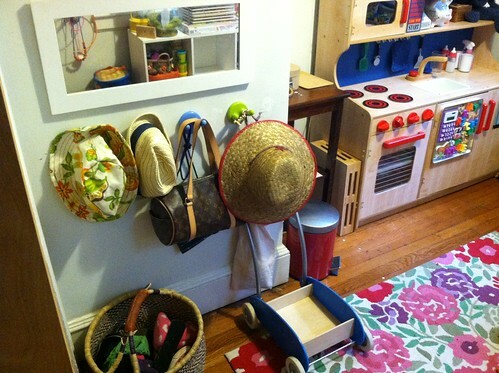 Just inside the doorway to the room are lots of hooks at her height for hats, necklaces and jackets. Below the hooks to the left is a sizable basket for shoes and slippers. Below the hooks to the right is a picnic basket sturdy enough she can stand on it and play with her nature shelf. What's nature shelf? They're common to both Montessori and Waldorf philosophies. Generally it's an area dedicated to all the fascinating finds from the great outdoors. I took a wooden box some flash cards came in and made one (errr...asked Charlie to make one) for M. She loves collecting natural objects, examining them, and showing them off when other kids come over. This little area provides the perfect spot for that. 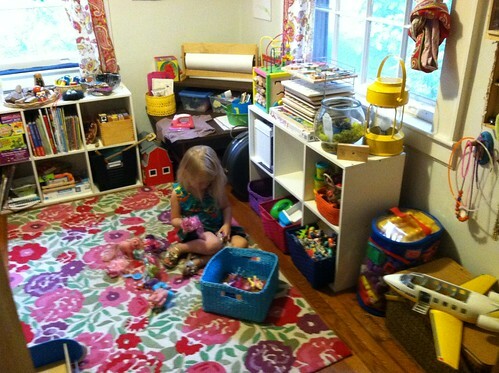 It's back to being a play room meant for play. At least for now. You're smart to begin teaching her these things from an early age. It'll go so much easier as she gets older than it would've if you'd waited!